Trams number 6, 7, 8 and 9 as well as buses number 12 and 30 stop right in front of the entrance at the tram and bus stop “Bärenplatz”. 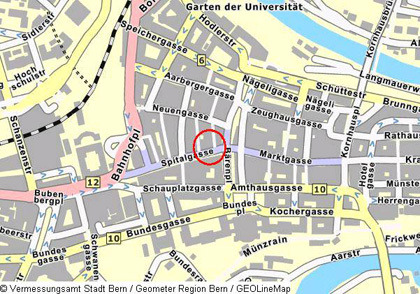 The parking garages “Metro” and “Bahnhof” are the closest for those coming by car. The main train station is only a few minutes walking distance from our practice. For a larger view please >>click.